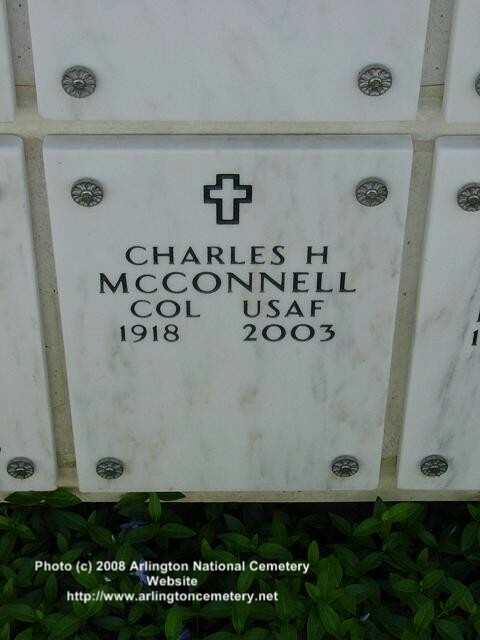 Retired U.S. Air Force Colonel Charles H. McConnell, 85, died December 13, 2003, at home. Born April 17, 1918, in Marshalltown, Iowa, he was the son of the late Earl and Ethel (Adel) McConnell. He grew up in California. He was a graduate of Herbert Hoover High School in Fresno, California, and received a bachelor's degree from Woodbury University in Burbank, Calif. While in the Air Force, he attended the Army Command and General Staff School in Fort Leavenworth, Kansas, as well as the Strategic Intelligence School and the U.S. Naval Language School, both in Washington, D.C. After his retirement from the military, he attended a course for golf course supervisors at the University of Massachusetts at Amherst. He served in U.S. Air Force during World War II and the Korean and Vietnam wars. During World War II he flew 700 combat hours as a pilot in B-17 aircraft in the Hawaiian, New Hebrides and Solomon Islands. He received the Distinguished Flying Cross, the Air Medal with Oak Leaf Cluster and the Meritorious Service Medal. Colonel McConnell was a command pilot with over 7,000 flying hours. He had been a vice wing commander of the 306th Bomb Wing at McCoy Air Force Base in Orlando, Florida. At Westover Air Force (now Joint Air Reserve) Base in Chicopee, Massachusetts, he had been deputy inspector general for the 8th Air Force. He was also the 8th Air Force director of logistics, assistant deputy chief of staff and deputy commander of the 99th Bomb Wing. He retired in 1970. He was appointed by the National Advisory Committee of Aeronautics to the Aircraft Fire subcommittee on aircraft fire prevention, and was later assigned to the American Embassy in Tehran, Iran, where he assisted in the 1954 Solar Eclipse Expedition. At Lockbourne Air Force Base, he was commander of the 4th and 353rd Strategic Reconnaissance Squadrons, as well as deputy commander for operations for the 301st Bombardment Wing and for maintenance of the 301st and 396th Bombardment Wings. Later, he was deputy commander of the 4081st Strategic Wing at Harmon Air Force Base in Newfoundland, and the 4082nd Strategic Wing in Goose Bay, Labrador. He also had special duty in Thule, Greenland. He was a life member of the Daedalians, the Society of the Strategic Air Command, the Air Force Aid Society and the Military Officers Association of America. He belonged to the American Security Council and the Air Force Memorial Foundation. He was also a member of the Westover and Orchards golf courses. After his retirement from the military, he owned and operated Lawn Medic Inc. in Bergen, New York, and in western Massachusetts. His wife, Gloria (Cassella) McConnell, died in 1997. He leaves two daughters, Cheryl Allie, of Chicopee, and Gail LaBonte, of Granby; three grandsons; a nephew; and a cousin. Memorial gifts may be made to the Make-A-Wish Foundation, 181 Park Avenue, Suite 12, West Springfield, Massachusetts 01089. The funeral will be Wednesday at 7 p.m. at Ryder Funeral Home in South Hadley. Burial will be at a later date in Arlington National Cemetery Columbarium, in Arlington, Virginia. Calling hours will precede the funeral from 4 to 7 p.m.